Since 1858, Jones Stevedoring Company has been the leading stevedore of forest product cargoes in the Pacific Northwest, pioneering cargo handling methods with a constant focus on improving safety and efficiency. Jones Stevedoring Company is highly regarded as an expert in the forest product trade. For this reason, Jones has consulted on both the layout of overseas forest product ocean terminals, and the design of new vessels for the log trade. Sensitive forest products require special handling and stowage techniques to protect them for safe, damage free ocean transport. Jones Stevedoring Company combines specially designed gear and equipment with over 155 years of knowledge and experience to safely handle and stow these cargoes. 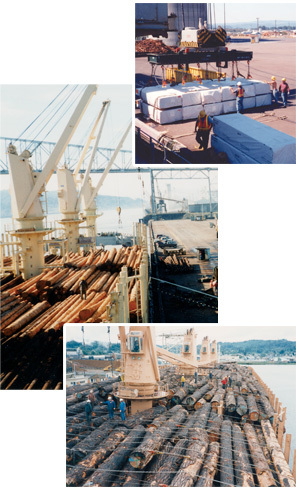 Jones regularly handles logs, lumber, pulp and wood chips at ports throughout the US Pacific Northwest. VIDEO: Watch Jones Stevedoring and the ILWU at work in Legacy on the Docks.